I signed this petition about the Koch brothers -- now can you? The climate change denying, union-busting, voter disenfranchising billionaires want to create a mouthpiece for their right-wing, “free market” ideals by buying eight newspapers from the Tribune Company, including the Los Angeles Times, Chicago Tribune, and others. We have to stop them. Use the link below to sign the petition with me. Then can you share with some of your friends, as well? We could finally see the shameful Guantanamo prison camp shut down, but it's going to take a final global push for President Obama to do the right thing. people trying to go to college." and demand a public vote in the U.S. Senate." Tell Governor O'Malley to Ban #Fracking in Maryland! Tell Governor O'Malley he needs protect Marylanders and stop pursuing fracking. That's why I signed a petition to Governor Martin O'Malley. What else will you and I find out? Every day, more facts about the Obama administration’s radical third-world tactics hits the news . . .
Last week, you and I learned the Obama administration wiretapped Associated Press reporters. But perhaps the worst of it all was that the Obama administration used the IRS to target and harass political enemies! GNU-Darwin Action Group, months ago, as the fight over gun control just began to rear its ugly head, your National Association for Gun Rights drew a line in the sand . . .
No more gun control. No deals. Not one more gun owner’s name. Not a single bit more information about American gun owners for the federal government. PERIOD. Stories like these are exactly why. Today, I’m counting on you to sign a NEW No Gun Control/No Deals petition to your U.S. Congressman and Senators IMMEDIATELY. If you've already signed your new petition, I’m counting on you to forward this email to every pro-gun friend and family member you have. The Obama administration is clearly drunk on power. Early in President Obama’s first term, you and I learned firsthand the lengths his administration would go to try and RAM gun control down our throats when they just looked the other way while bloodthirsty Mexican gangs ran guns across the border -- resulting in the tragic death of U.S. Border patrol agent Brian Terry. That should have tipped enough folks off . . .
And in December of last year, after the horrific tragedy in Newtown, Connecticut, the Obama administration jumped into action, pushing a massive wish list of anti-gun schemes, thinking they had the perfect excuse to ram gun control down our throats. Not one would have made an ounce of difference. Criminals and killers don’t get their guns legally. Like the Newtown killer, they often steal them. GNU-Darwin Action Group, I know I’m not breaking any news here, but the gun-grabbers know all of this. *** They don’t want more “background checks” (GUN REGISTRATION) to prevent murders. *** They don’t want an expanded federal “NO GUN” database to keep the mentally ill from getting their hands on guns. They want our names, our information and records of our gun purchases so they can set the stage for the day they can finally CONFISCATE our guns. And they prey on Americans’ fears of “too much freedom” and politicians’ desire to appear “reasonable” to hasten that day. And I have one simple message to politicians in BOTH parties. If you think it’s “reasonable” to hand this President and this lawless administration more information about American gun owners after all the outrageousness you and I see hitting the news, THINK AGAIN. GNU-Darwin Action Group, if you and I hand over our freedom and our liberties, it WILL eventually be abused by those in power -- regardless of whether it’s President Obama or someone else occupying the White House. I’m tired of watching Washington, D.C. strip away our liberties. And I want to do everything I possibly can to ensure our Second Amendment freedoms aren’t flushed away from members of both political parties in Congress. If you agree, I’m counting on you to do two things . 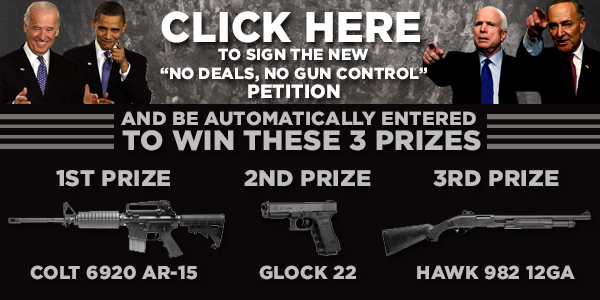 . .
First, sign your new No Gun Control/No Deals petition to your U.S. Congressman and Senators IMMEDIATELY. During the last fight on gun control, your National Association for Gun Rights delivered literally every petition we had. I need to reload. And FAST. Secondly, please forward this email to every pro-gun friend and family member you have. Thirdly, please chip in $20 TODAY. Your generous contribution will help me reach even more Second Amendment supporters. But if that’s too much, please agree to $10 or at least $5 immediately. GNU-Darwin Action Group, Members of Congress who want to hand this President -- or any other -- more information about American gun owners after the news of the last week need to have their head checked. You and I have a chance to seize the momentum in this fight over gun control. So please sign your NEW No Gun Control/No Deals petition, forward this email to as many friends and family members as you can, and chip in $10 or $20 TODAY. P.S. Members of Congress who want to hand this President -- or any other -- more information about American gun owners after the news of the last week, need to have their head checked. If you agree, please sign your NEW No Gun Control/No Deals petition, forward this email to as many friends and family members as you can, and chip in $10 or $20 TODAY. I just signed this -- will you? The interest rates on federal student loans will double this July if Congress doesn't take action. Fortunately, Senator Elizabeth Warren has introduced legislation that would provide a one-year fix to the impending doubling of students' rate by setting the student loan interest rate at the same level the Federal Reserve offers to big banks. Senator Warren's legislation is powerful and to the point. We bailed out the big banks. Why then deny students who weren't responsible for wrecking our economy the same deal we give the banks? I just signed a petition urging my senator to co-sponsor Senator Warren's student loans bill. I hope you will do the same. It was recently revealed that the Department of Justice secretly seized two months of telephone records of a large number of Associated Press reporters. This unprecedented, indiscriminate surveillance of journalists is an attack on the First Amendment that will have a chilling effect on the ability of these journalists and others to function as a free press. And unfortunately, it is only the most recent case of overreach by the Justice Department in its overzealous pursuit of whistleblowers. Tell Attorney General Eric Holder: Stop attacking the First Amendment and end your war on whistleblowers. Right-wing politicians in the Senate are trying to give CEOs even more power. They want to stop President Obama's nominations to the National Labor Relations Board, the independent agency that protects workers' rights, in the hopes that they can shut it down. If the NLRB is shut down it will make it easier for corporations to deny workers their right to fight for safer workplaces, health care or a wage they can support their family on. It's disgusting and we need to make sure it doesn't happen. Can you take a second to send your senators an email and ask them to confirm President Obama’s NLRB nominations? MARC trains only allow folding bicycles, which are typically heavier and more expensive than regular bikes, and bikes are one of the best ways of making public transportation practical, by helping people make up for gaps and problems in that transportation system. Especially in this tough economy, allowing regular bicycles would enable more people to adapt to available public transportation, rather than waiting for transportation to adapt to them. In other words, this would allow Maryland to get the most bang for its transportation bucks. "Allow regular bicycles on MARC trains!" It sounds like satire, and it would be funny if it weren't true. The Intrepid Sea, Air, and Space Museum in New York City is planning to give Henry Kissinger an award on May 23rd for "defending freedom and democracy." George Washington National Forest is one of the crown jewels of America's national forest system on the East Coast. But that could change if the U.S. Forest Service opens hundreds of thousands of acres of the forest--including old-growth forest, endangered species' habitats and drinking water supply areas--to invasive natural gas fracking. Opening the forest to fracking could threaten the drinking water of over 4 million people in Richmond, VA, Washington, D.C., and the Shenandoah Valley whose drinking water supplies are fed by the forest. The Department of Agriculture, which has final approval over the Forest Service plan, has stated that it will announce a decision on whether to allow fracking in the forest next month, which gives us just a few weeks to put pressure on Secretary of Agriculture Tom Vilsack. Monsanto has taken over the USDA. Tell Congress to act now. As part of End Mountaintop Removal Week this week in Washington, D.C., Appalachian residents brought toxic water from their homes to the headquarters of the EPA and members of Congress. Urging federal action to protect water quality from coal mining in Appalachia, citizens -- with the support of the Center and other groups like Alliance for Appalachia -- are calling on the EPA to develop a rule that would create strong water-quality standards. We're also urging Congress to put a moratorium on mountaintop-removal coal-mining permits until the impacts of pollution from the radical form of mining have been addressed. Numerous studies have linked mountaintop removal with human illnesses and with deformities in downstream wildlife. Take action today by contacting your representatives -- demand federal action to protect people and endangered species in Appalachia from mountaintop removal. There are certain things that I really like about Baltimore. One of them is Inner Harbor. Here is another shot through the pizza restaraunt window. This is my view for dinner this evening. Don't Koch the L.A. Times! Tell the Tribune Company: Don't sell out journalism by selling your papers to the Koch brothers. You're probably aware of the Orwellian gun control package that was recently signed into law in Maryland - a law consisting of registration, confiscation and outright bans of certain firearms. But if we can get only 18,000 signatures against the law by May 31, 2013, we will have started a process which suspends gun bans, gun registration, and gun confiscation for 17 months - and opens up the possibility that, in an "off-year," Maryland voters will repeal it. (1) The gun ban (Senate Bill 281) will ban large number of semi-automatic long guns, including 45 specified guns and any guns that look like them. (2) The gun ban imposes a 10-round magazine ban, even though many firearms are made to accommodate larger magazines. (3) The gun ban will establish a new handgun licensing requirement, which will require that you be fingerprinted like a common criminal. (4) The gun ban will expand that list of people stripped of their Second Amendment rights - thus, leading to the confiscation of their guns. And the new law would send you to jail if you fail to realize that a gun in your collection is missing. But, if we can get 18,000 signatures on petitions by May 31 - and 55,000 by June 30 - this unconstitutional law will be suspended until November, 2014. And we will have opened the door to a vote to repeal the law entirely. The so-called "Free State" is among the least free states in the country. But, in an off-year, buoyed by a huge conservative turn-out fueled by the messy phase-in of ObamaCare, plus a public reversion to fingerprinting private citizens, the "impossible" might just be doable in 2014. ACTION: Please download the petition at http://freestatepetitions.com. Circulate it for signatures among your friends and neighbors. And, if possible, make a contribution to help them get the 18,000 signatures they need by May 31. And above all, make sure that you and your like-minded friends and family are registered to vote! You can begin the process at the above URL. Our elected representatives are finally ready to tackle the thorny issue of immigration reform. But some members of Congress are using this opportunity to push the same destructive, unhelpful border-security policies that have already caused massive damage to the lands at our borders, along with their people and wildlife. We need your help to make sure immigration reform helps, instead of hurts, the biodiversity of our borderlands. Current immigration reform proposals call for billions of dollars to expand the ineffective, wasteful, incredibly destructive border wall. They want the Department of Homeland Security to waive environmental review for wall-building and border-enforcement activities, and they want to push their agenda through without public input. This could wreak real havoc, hurting wildlife, causing major flooding and erosion, and doing massive damage to national parks and refuges. Please take action now to send a clear message to your senators: "No Walls, No Waivers." Alaska's famously charismatic sea otters are finally on a slow road to recovery. After they were almost wiped out by greedy hunters and trappers in the international fur trade, limits were placed on hunting -- allowing only Alaskan natives to hunt the otters, for their native handicrafts. But the playful animals' recovery could quickly be derailed: The U.S. Fish and Wildlife Service is now trying to change the definition of handicrafts in a way that will likely lead to more sea otter killings. Take action now to tell the Fish and Wildlife Service to stop its backdoor attempt at predator control -- it will hurt vulnerable sea otters. Here are some photos of Liberty Reservoir from the Liberty Road bridge. Woods, lake, river are all to be found here. There are some hills, and some would likely consider the bicycling to be a little advanced, so use care. Use to Metro rail or 40 Quickbus to get you closer and maximize your time. There's a boat ramp and fishing, etc. It would be no surprise to find someone to rent you a boat. Swimming in season is sometimes found in the river areas to the south, although it is reportedly prohibited in the reservoir.